Are you suffering from a bump on top of the big toe joint? This is not a bunion. 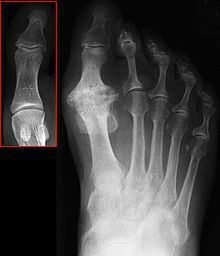 A bunion is a bump on the outside of this bone (metatarsal), which is due to the metatarsal moving outward. This problem is know as Hallux Limitus, stiff big toe joint. 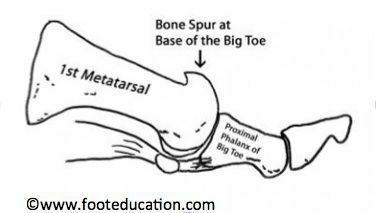 The spur on the top of the big toe joint is due to excessive pressure that is being placed along the joint. When there is excessive pressure along the area, the bone will protect itself and lay down calcium. The joint eventually breaks down and becomes arthritic. The patient will experience pain in the joint when he or she tries to move it upward. This movement is necessary when you walk. The patient will then compensate for this problem by walking more on the outside of the foot. This can lead to lower back, hip, and/or knee issues. So, sometimes, a patient will not complain of foot pain, but of other joint pain. Treatment in the early stages consists of eliminating the pain and the forces that are being applied on the joint. This can be done with anti-inflammatory medications, ice, physical therapy, and sometimes a cortisone injection. Orthotics are prescribed in the early stages to eliminate forces along the joint. If the joint has been deteriorated, then a more aggressive approach will be needed. This consists of different types of surgery. One possible surgery is a joint replacement. One of the more common joint replacements is the HemiCAP which is a titanium implant that goes over the metatarsal head and provides a nice gliding surface for the toe to glide over. Some individuals are not good candidates for this procedure. These are patients who have a really severe degenerative joint. In this case, we fuse the joint by removing any remaining cartilage and apply a bone plate with screws to prevent any further painful motion. The key is to know that this bump is not normal and is a sign that the joint is deteriorating. Please do not ignore this problem, as it becomes more difficult to treat in its later stages. If youwould like to make an appointment to discuss your treatment options click here.